One-year old dinosaurs! Come celebrate at Dino Golf Tonbridge. If there is one thing that never fails to capture my kids' imagination, it's dinosaurs! And we're lucky to have some on our doorstep here in Kent. 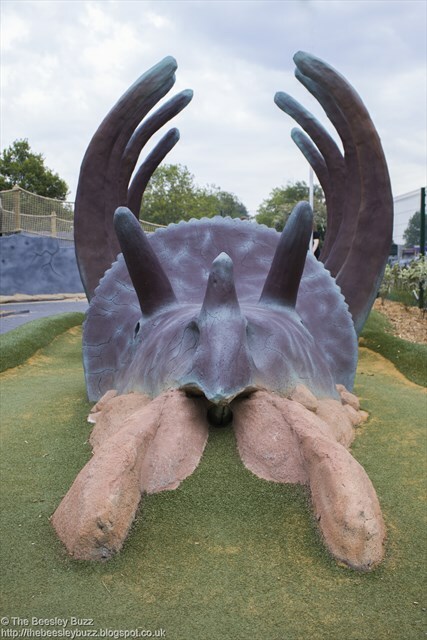 Mr. Mulligans Dino Golf in Tonbridge is a really fun family adventure golf venue with some brilliant and BIG dinosaurs. 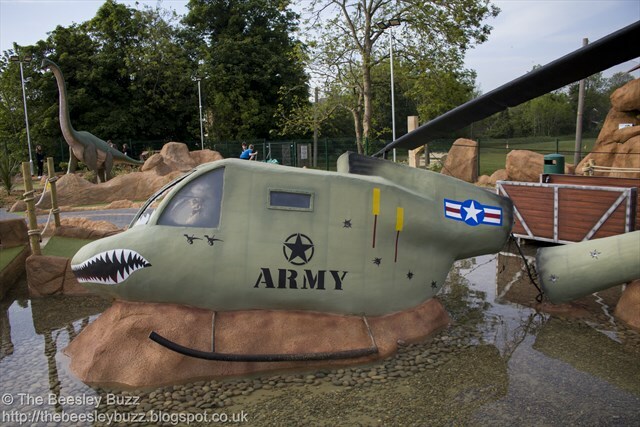 We visited last year soon after it opened and were wowed by how much effort had gone into the dino theme - Complete with a 'crashed helicopter' and fantastic waterthemed feature where you pull yourself across on a raft. And of course, plenty of dinosaurs! This week Mr Mulligans Dino Golf turns one year old. To celebrate they have planned a fabulous fun day on Saturday 5th May 2018 (from 10am onwards). There's going to be complimentary face painting and balloon modelling (squee!) and FREE entry for under 5's. Brilliant! What's more, slush will be BOGOF (Buy one get one free) so there's going to be plenty of fun - let's hope for plenty of sunshine too. 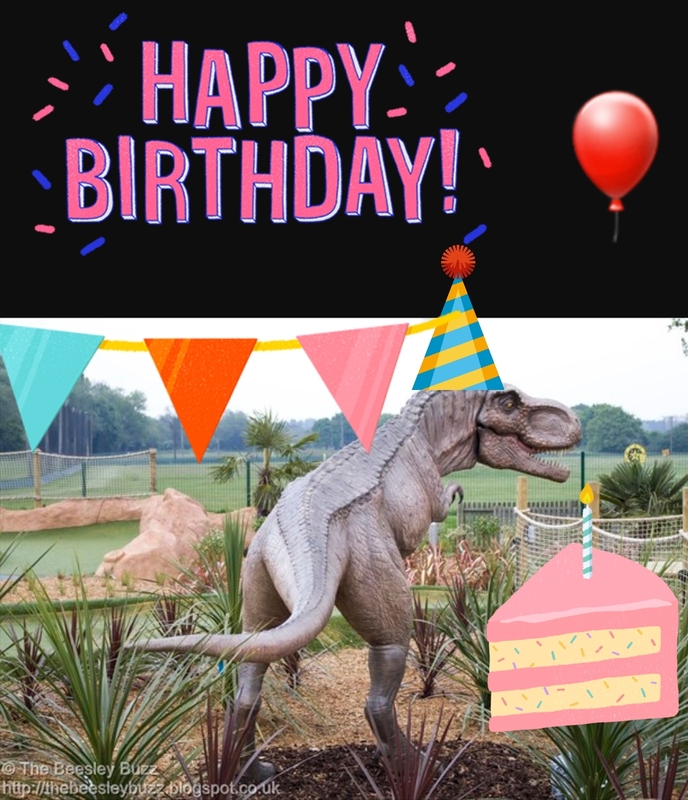 We'd like to wish Dino Golf a very happy 1st birthday from us here at The Beesley Buzz and if you're looking for something fun to do on 5th May, why not pop down to Dino Golf in Tonbridge and join in all the fun. 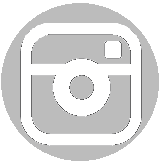 You can see our full review of Dino Golf here and you can keep up to date with all the latest news from dino golf on Facebook and Instagram. 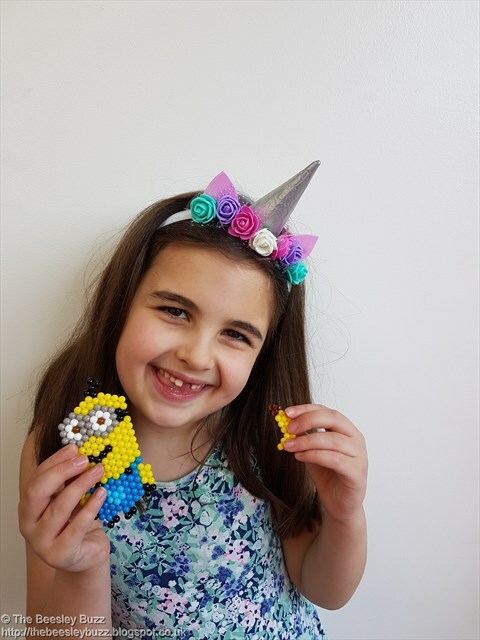 Enthusiasm was definitely the right word to capture the mood when the latest Aquabeader assignment came through for Miss T; to review the Aquabeads Despicable Me Minions Playset. Aquabeads are clever little colourful beads that stick together with nothing but water once they've been arranged into a design. 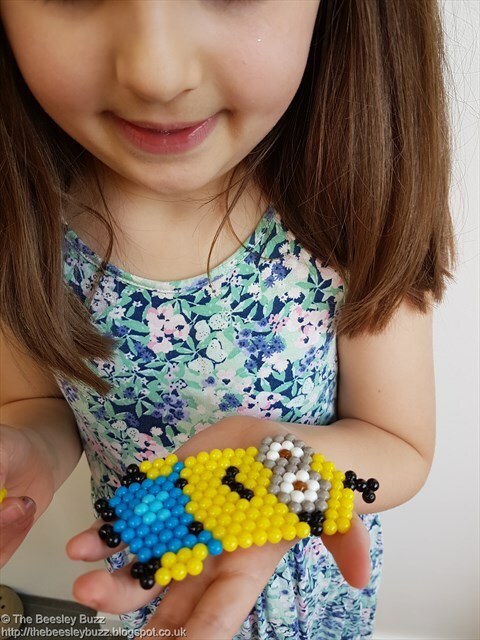 Miss T ADORES Minions and she ADORES Aquabeads - so the two combined! Wow! 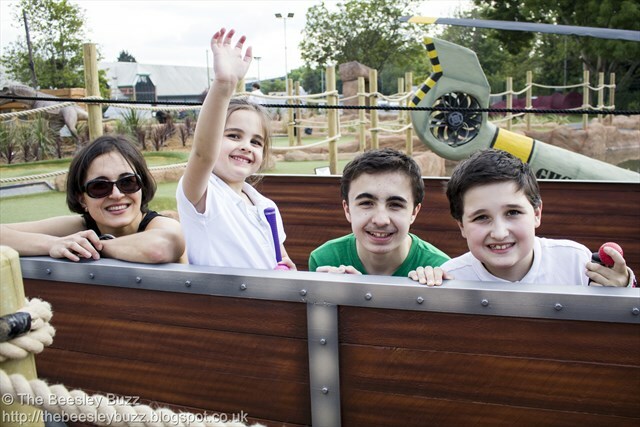 We've spoken before about how we love the new innovations that the Aquabeads playsets have. Each new set seems to have evolved in some way with an improvement. This time there was a new design of sprayer (which works amazingly well! 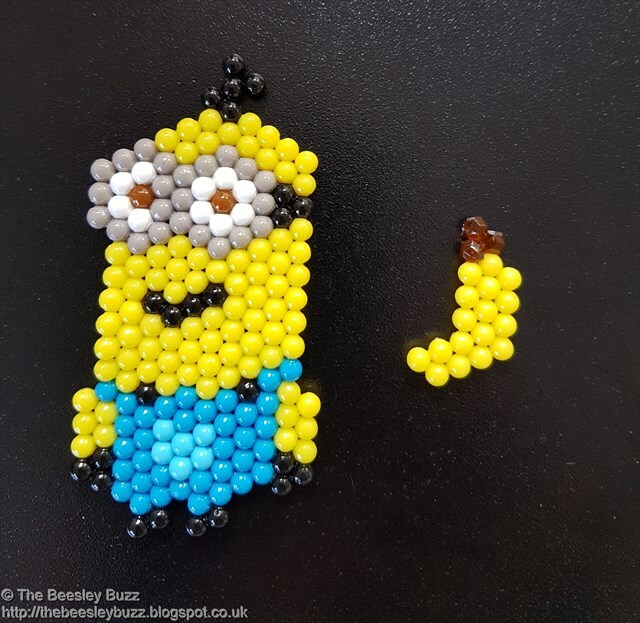 - more about that later) and a 'Bead Peeler' which is designed to scrape the beads off sooner rather than waiting for them to dry completely so that you can get back to using the table tray to make more Aquabeads minions designs even sooner. 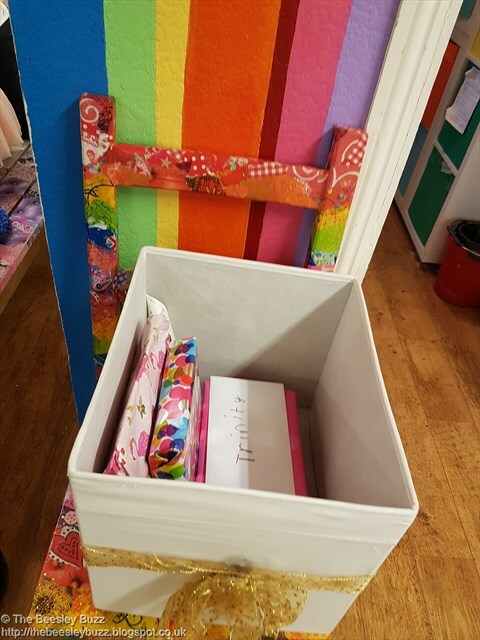 Also in this set was the main yellow palette for storing the 700 beads included (the table tray cleverly clips on top when the set is not in use to keep the beads safe) and 2 template sheets. With designs printed on both sides, this actually gives 4 different design options. Miss T set to work straight away. I love seeing her independence grow. Although she has loved Aquabeads for ages, she would often need someone to help her considerably but this time she was off busily working on her design by herself. After a while she dug out the bead pen from one of her other aquabeads sets as she found it easier to place the beads using the pen rather than her fingers. The pen is not included in this set but you can buy it separately if you need one. Then it was time to spray water onto her design using the sprayer. The spray bottle was different from the previous ones we have had in other playsets. This time it is more of a proper spray that comes out using a pump spray mechanism rather than a squirt of water like the previous sprayers. Because the water came out in a finer mist, the beads didn't get super-soaked through so were quicker to dry and turned out shinier looking. We tried the Bead Peeler after 10 minutes but I think we are going to need a little bit more practice with it. As we weren't in a hurry to do another design, we left the Minion and his banana on the table tray to dry. Aquabeads are a pretty mess-free way to play but with the new sprayer, the table tray ended up without any bead residue left in it making it ready to play again next time (previously I would give them a good wash to get any residue from the wet beads off). Needless to say Miss T was thrilled with the minion she had made - Kevin I think it is (she would know but isn't here as I write this) and the cute little banana. After all you can't have minions without Ba-na-naaas. This is a super Aquabeads set that would make a great gift for minions fans. Or Aquabeads fans. Or both. You can buy the Aquabeads Despicable Me Minions Playset here. 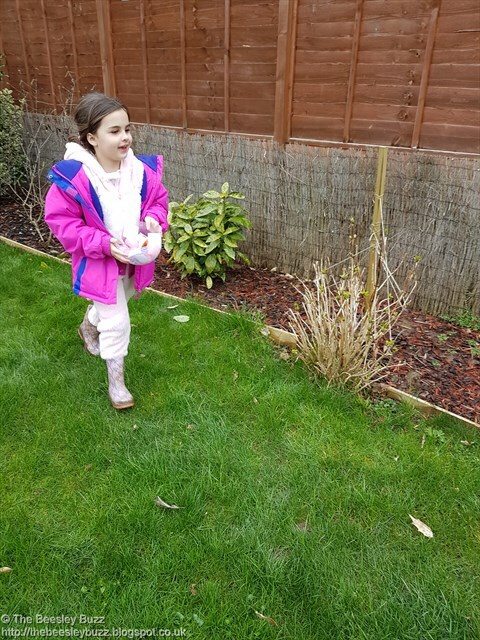 Our Easter tradition over the past 12 years has been the annual Easter egg hunt at Granny and Grandad's house. Things had to be postponed last year as Miss T ended up in hospital on Easter day as a result of getting chicken pox. It is one of the problems associated with being on methotrexate - even common childhood illnesses can take a serious toll on her health - It was almost a week before she was able to come home and was on an acyclovir drip several times throughout the day and night. But the year before and every year before that it was a regular occurrence. 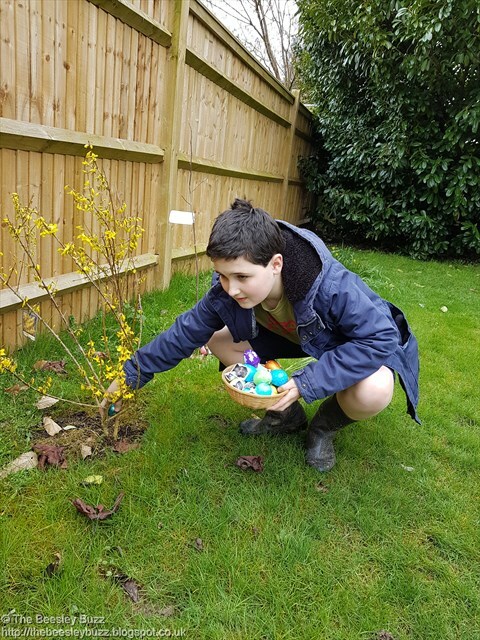 Photos from our 2015 Easter egg hunt can be found here in the days that Holly dog was with us and used to join in the fun too. 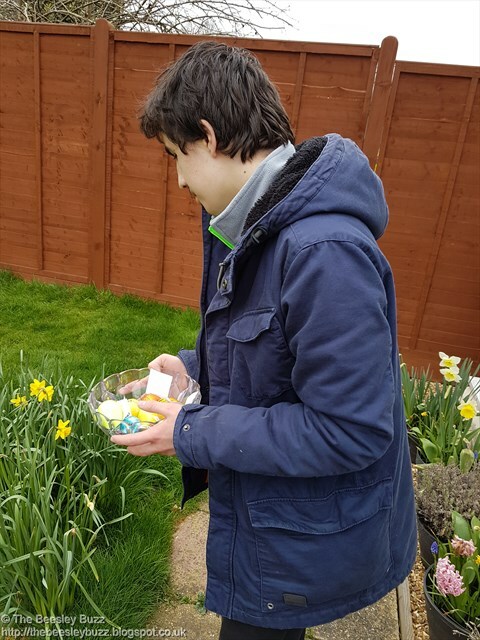 This year the Easter egg hunt went ahead despite hearing the sad news that my dad had passed away in the early hours of Easter morning. Massive thanks to granny and grandad for another fabulous Easter egg hunt! Miss T is 6 years old! Oh my - how time does fly by. 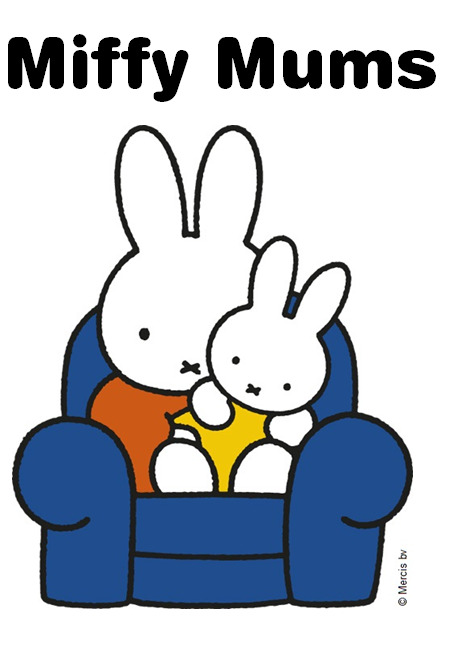 It is so strange to think that when Miss T was born, D was six years old - the age she is now. And it is times like this that I love the wonder of blogging. We began the blog in 2012 - the year she was born and it seems that the first proper milestone update was at 9 months old but then fairly frequently after that at 10 months, and 13 months and so on. As well as capturing other milestone moments like her teething, her 1st birthday, getting new shoes when she started walking. It is so lovely to look back on all those memories that would be so much harder to do without the blog. Of course there are memories of things we wish were different - when she first developed Juvenile Arthritis. How I would do anything to take away her JIA. I pray it won't define her, or limit her and I pray she will overcome it to achieve her dreams in future. So now she is 6. 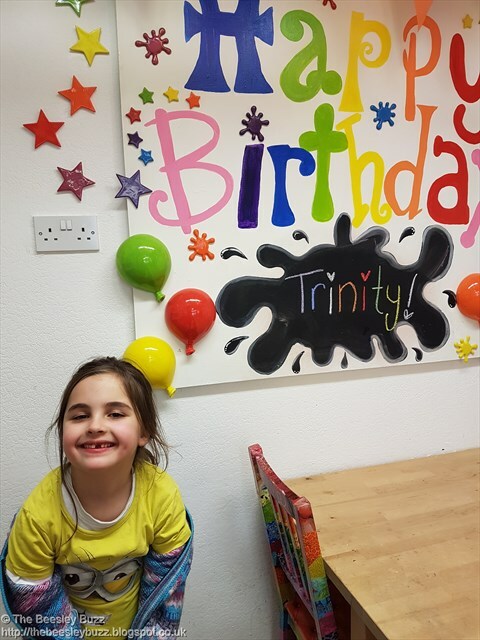 There was more than one day of celebrations as she had her party with just a few friends pottery painting on one day, then having granny and grandad over the day before her actual birthday and finally the big day itself. 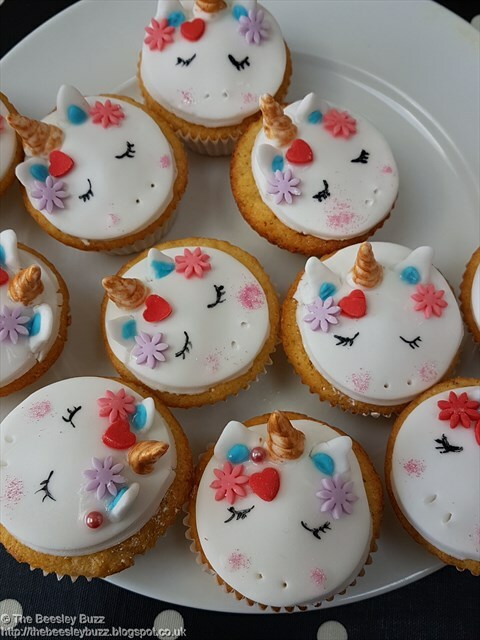 She helped me make unicorn cupcakes which turned out super. It was the first time we had ever made them. Apparently a group of unicorns is called a 'blessing of unicorns' - what a beautiful term for it. 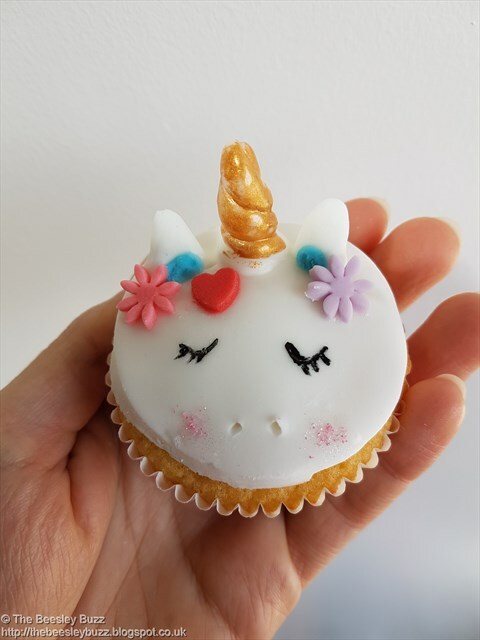 Little had we realised that just after we made the cupcakes, it was #NationalUnicornDay. Who knew there even was such a day! So 6 years old. My baby is now 6. I could not have wished for a more amazing daughter. So caring and kind and sensitive and brave and creative and imaginative and strong and super!